Looking for commercial, military or space solutions? ASK AMERICA in the USA Partnership Pavilion at the Dubai Air Show 2017. 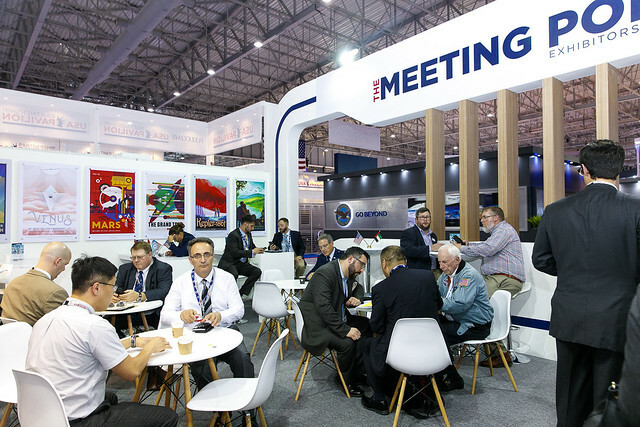 Among the many reasons to visit the Dubai Airshow, the USA Partnership Pavilion featured more than 80 of America’s most innovative partners, products and services. Click the links below to learn more about the U.S. presence at the Dubai Air Show 2017. Exhibitors and activities in the USA Partnership Pavilion generated extra media coverage of America’s presence at the show. 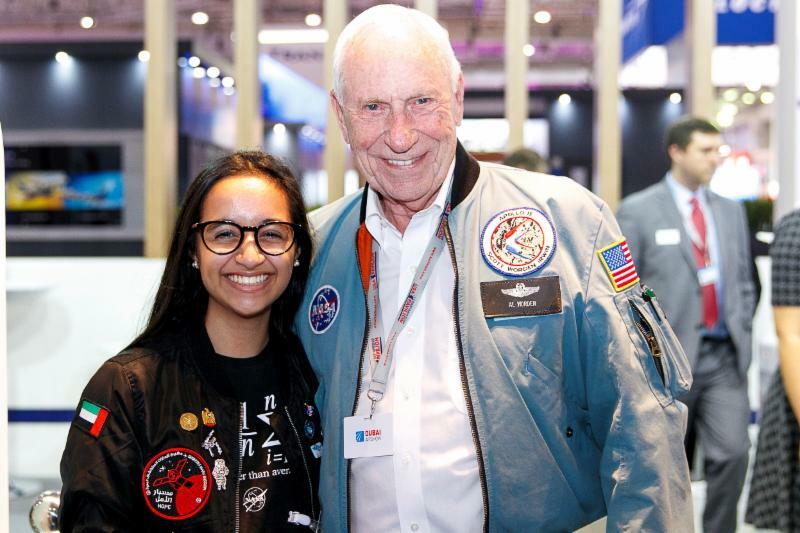 In particular, Kallman Worldwide's special guest, Col. Al Worden, USAF-Ret., Command Module Pilot of Apollo 15, made headlines during the show as “America's ambassador for STEM" — Science, Technology, Engineering and Math — education and careers. His participation in official USA Partnership Pavilion programs, industry outreach and presentations on-site and visits to UAE high schools and universities excited students and executives alike, and attracted extra attention and interest in U.S. industry on-site. Click below to read some of the Pavilion news highlights from the show! — View a complete listing of American exhibitors at the Dubai Airshow 2017. — View the USA Partnership Pavilion floor plan, with all first-time DAS exhibitors highlighted. — Explore Pavilion exhibitor profiles, including product details, site links & contact information. 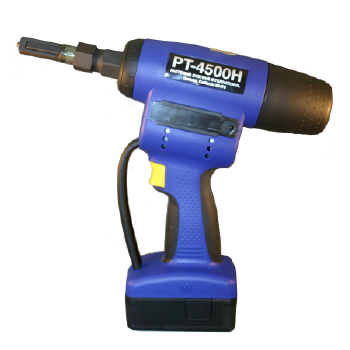 The PT-4500H cordless riveter provides unparalleled speed, performance and ergonomic features that leads the industry. Capable of installing rivets and aerospace lock-bolts up to 1/4 (6mm) diameter with the need for an air line. The tools weighs less that 5 pounds, including the battery pack. Visit booth 1384 for a demonstration. Cost-effective IMUs offer ultra low-noise sensors and high-speed electronics in environmentally-rugged packages as small as 0.6 cubic inches for the most demanding aerospace, defense and industrial applications. Since 2005 Gladiator Technologies has been supplying high-performance, MEMS-based inertial systems to demanding commercial and defense applications. The new SX family includes the ultra-small LandmarkTM 005 IMU and LandmarkTM 007 high-range IMU, LandmarkTM 60 high precision IMU and G300D digital three-axis gyro. All SX products feature ultra-low noise, low-latency performance in compact, light, low-power packages. Gladiator Technologies products are available through www.gladiatortechnologies.com. For more information, see Mark at the Dubai Airshow USA Pavilion. Gogo Business Aviation signed K5-Aviation as its first 2Ku business aviation customer in Europe, marking a significant milestone for the company. Gogo’s 2Ku technology is the leading in-flight connectivity technology in commercial aviation and is available to business aviation customers flying larger private aircraft. The first airframe in business aviation that will fly with Gogo’s 2Ku technology is an Airbus ACJ319 operated by K5-Aviation, a leading operator of ACJ aircraft, based in Germany. Gogo Business Aviation, the leading provider of broadband connectivity products and services for business aviation in North America, is expanding its reach to become a global provider with the announcement of a high throughput satellite service for business aviation. The new service will utilize Gogo’s existing Ku-band satellite network currently serving several of the largest commercial airlines globally. Service is expected to be available in the second half of 2018. Metalworking fluids are the most overlooked yet most crucial aspect of the machining process. The right lubricant can increase surface quality, extend tool life, and improve safety. Specifically, the development of advanced metalworking fluids has led to significant improvements in machining for aerospace. Hangsterfers recently had their advanced metalworking fluid, S-787 independently tested. The results showed that S-787 increased surface quality and reduced cutting forces by at least 40 percent over other traditional cutting fluids. New Generation Ground Support Equipment (GSE), Now Ready for Export! Hydraulics International, Inc. has over 41 years of producing cutting-edge aircraft ground support equipment (GSE). A very successful Dubai Airshow 2015 with Kallman that lead us to a bigger Booth to showcase our New Generation GSE at Dubai Airshow 2017! Universal Hydraulic Test Stand (UHTS) for supporting F-16, C130, F-22, F-35, B-1, B-52, C-130, C-5A/B, KC-135E/R, etc. High Purity Self Generating Nitrogen Servicing Carts (HPSGNSC) capable of producing gaseous nitrogen at a 99.5% purity level @ 5000 psi with high flow of not less than 30 SCFM. A/F27T-12 Hydraulic Component Test Stand, which is newly designed to perform all testing of new generation military / commercial Aircraft Hydraulic, Pneumatic Components, Pumps & Motors etc. Air Forces / Airlines, Aircraft and Helicopter Manufacturers, Hangars and MRO Facilities. iAccess announces a contract award from the USAF Material Command for C-130H Avionics Modernization Program (AMP) Increment 1: Automatic Dependent Surveillance–Broadcast (ADS–B) Out & Mode Select (S) Enhanced Surveillance (EHS). The AMP Increment 1 addresses current and near-term CNS/ATM mandates, and limited safety upgrades, enabling the C-130H to safely and effectively operate in global air space. iAccess will design and integrate ADS–B Out & Mode S EHS kits for 172 USAF aircraft. JDS International Inc. is an international military parts broker and manufacturer. JDS provides parts as simple as o-rings and hardware to complex assemblies such as displacement gyroscopes, fuel control systems, avionics, and structural parts. We commit to provide products and services which meet or exceed our customer’s expectations. All JDS personnel understand that quality is not only a process, but also an individual responsibility, with an emphasize on a continuously improving quality management system. CARD is a self-contained sustainment solution for both legacy and 5th Generation aircraft, forward-deployable by land, sea, and air, providing armament repair capability at the point of use. CARD optimizes mission readiness by streamlining repair processes and reducing the logistics footprint, making spares provisioning more efficient. Including Alternate Mission Equipment support from Marvin Engineering Company and test sets from Marvin Test Solutions, CARD is a complete support solution for current and emerging requirements. LEKTRO Inc., is proud to announce the certification of their AP8950SDB-AL-200 & AP8950SDB-AL-250 for towing the Boeing 737 MAX. It is the first Towbarless Towing Vehicle (TLTV) to be certified to handle the new Boeing aircraft. With a range from turboprops to the Boeing 757, LEKTRO’s -250 model is the most versatile tug available on the market. LIFT Aviation launches a line of new and innovative products built specifically for pilots. LIFT Aviation products include pilot shoes, helmets, flight caps, knee boards, and more! Introducing LIFT Aviation, the new definition of performance in flight. Whether you are a seasoned pilot with hundreds of hours spent in the cockpit or an aspiring enthusiast preparing to take flight, LIFT Aviation delivers gear that provides safety, comfort and style as you take to the open skies. We are bridging the gap between apparel and safety products currently available to pilots and the quality and performance their lifestyle requires and deserves. The SIE & Dassault Systemes partnership leverages Dassault's industry-leading solution experiences based on its 3DEXPERIENCE platform – “Passenger Experience” covering processes from initial customer interaction through design validation and verification, on to marketing and sales, and “License to Fly” to accelerate the certification process – incorporating SIE’s certification expertise in delivering approved data content and ensuring regulatory compliance for cabin design and development projects through digital continuity thereby reducing schedule risk and cost overruns. The CeeLok FAS-T connector is one of the most rugged, small, 10 GB/s ethernet, field terminable I/O connectors is the Aerospace, Defense and Marine marketplace. It has been designed to provide substantial size and weight savings via its small shell size 8 form factor. Its unique "T" pin pattern minimizes electrical impedence and crosstalk. The CeeLok FAS-X connectors use reliable AS39029 contacts and standard M38999 connector shells designed for rugged Environments. Distributed, Integrated Modular Avionics Packaging - Miniaturized. MiniMRP avionics is the next generation of integrated circuits, putting computing power into 40% smaller packages at lower costs. The ability to interconnect small-form-factor electronic devices, either directly or over a network, enables distributed systems that replace traditional centralized systems. With MiniMRP avionics, the big box in the avionics bay can be replaced with many small boxes distributed throughout the aircraft, helping to meet your SWaP reduction requirements. TE designs and builds components and Solutions to control and manage communications, on-board computers for navigation, power management, and multiple subsystems throughout the aircraft. TE’s interconnects provide reduced size and weight solutions while meeting the demands for high bandwidth and increased data transfer rates. TE is one of the leaders in the development of distributed avionics architecture to collect and distribute information throughout the aircraft within a standardized modular format. Producing 95% of North American-made commercial aircraft, Washington state's vast network of 1,350 suppliers and 100,000+ workers is soaring to new heights in its second century of global aerospace leadership. 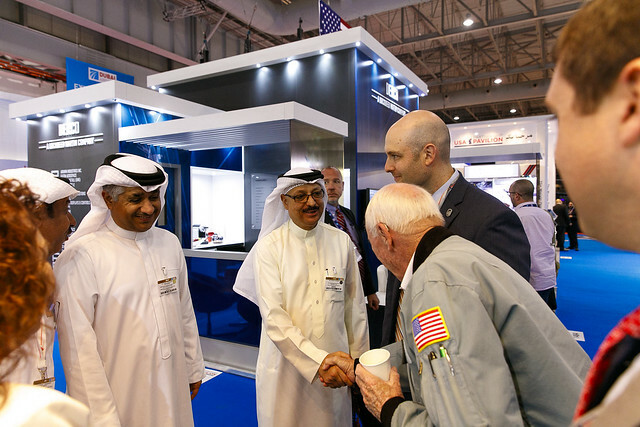 Washington State Commerce Director Brian Bonlender heads his state's second delegation to the Dubai Airshow. Featured are cutting-edge engineering, design and production companies delivering everything from drone-based data collection and analytics to the revolutionary SkyDeck concept. Some 800 multinational firms do business in Washington because of world-class R&D, top workforce, Pacific Ocean port, tax incentives and more. Featured ChooseWashington exhibitors are Adaptive Aero Technologies, Gladiator Technologies, Hobart Machined Products, IDEA International, Net-Inspect, SIE and Windspeed. Windspeed Technologies is pleased to announce that it has completed conceptual designs of the SkyDeck for wide bodied as well as narrow bodied aircrafts. The options offered include a two-seat version, single seat, elevator, staircase, telescoping seat and removable seat version.